Wall Street no longer believes President Trump's agenda is a slam dunk. 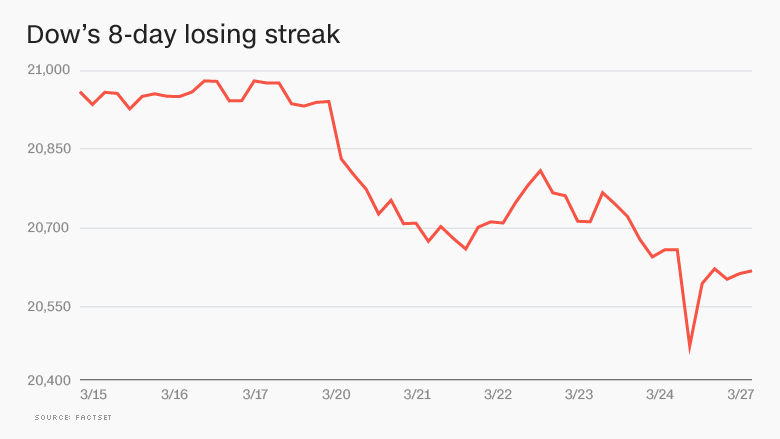 The Dow fell on Monday for the eighth day in a row, its longest losing streak since 2011. Trump's stunning failure to repeal and replace Obamacare spooked investors, sending the Dow sinking as many as 184 points in the first few minutes of trading. But the index rebounded from those early losses, closing down by 46 points. The Nasdaq eked out a gain of 0.1%. The recent market retreat is a reflection of rising fears on Wall Street that Trump's bold promises of sweeping tax reform, regulatory relief and infrastructure spending is in doubt. Investors have begun to contemplate that the Trump agenda will be delayed, watered down or even derailed. "Global financial markets are in a risk off mode after the political spectacle that unfolded last week on Capitol Hill," analysts at Rabobank wrote in a report on Monday. CNNMoney's Fear & Greed Index briefly tipped into "extreme fear." That's a dramatic reversal from "extreme greed" shortly after Trump took office. The Dow is on track for its first monthly decline since October and worst month since January 2016. Big banks, previously one of the hottest pockets of the market, suffered the worst losses on Monday. Morgan Stanley (MS) fell over 2%, while Goldman Sachs (GS) and Bank of America (BAC)shed over 1% apiece. The concern is that if Trump wasn't able to replace Obamacare, a law that Republicans almost universally detest, then how will he tackle even more complex undertakings? Trump has pledged to quickly pivot to tax reform, but that could be even more challenging, especially given the serious GOP fractures exposed by the the health care defeat. "If the repeal and replace was any indication, tax code reform is going to have a really hard time finding any traction. It's not something that can take place overnight," said Peter Kenny, an independent market analyst and founder of Kenny's Commentary. That's a problem because Wall Street had been banking on the "massive" tax cuts that Trump promised by August. The Dow zoomed as much as 2,800 points since the election on these hopes. But because the fundamentals (earnings, economic growth) haven't really improved, stocks have become expensive. "Has the stock market priced in the perfect scenario that is becoming clear that we just won't get?" asked Peter Boockvar, chief market analyst at The Lindsey Group. "A watered down Trump agenda with no changes of substance to health care and a more modest tax reform bill is NOT what I believe is currently priced in to stocks," Boockvar wrote in a report to clients. Of course, the stock market has had enormous gains since Trump's victory, and a pullback is long overdue. A cool-off period is a healthy development for the Trump rally, most experts would agree. It's also worth noting that while the Dow is on track for an eighth day of declines, it hasn't descended all that much. The Dow is down less than 2% during the slump and remains less than 600 points away from the all-time high set on March 1 following Trump's well-received speech to Congress. By comparison, the last time the Dow fell eight days in a row back in August 2011 the index had shed an alarming 7% of its value. Michael Block, chief market strategist at Rhino Trading, joked that the recent selloff is due to the "shocking reality that President Trump can't snap his fingers and get business and stock friendly policies enacted." Block said "we are seeing the knee jerk reaction to that ideal being quashed." Wall Street will be looking for signs that the Trump agenda is not stalled. 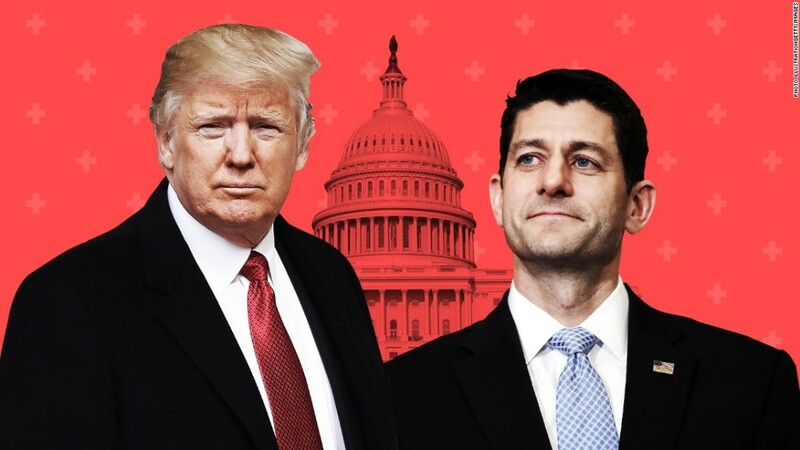 While the health care failure is "undoubtedly a negative signal" for the rest of Trump's agenda, it is "far from a death knell," according to Isaac Boltansky, a policy analyst at Compass Point. Still, he said the Obamacare saga signals a final tax reform deal that is "less sweeping -- both in scale and scope -- than the market is currently reflecting." Wall Street hasn't been helped lately by renewed trouble in the oil patch. Crude retreated another 1.5% to just over $47 a barrel on Monday amid continued concerns about resurgent U.S. shale production.